Click here for the recipe and video. 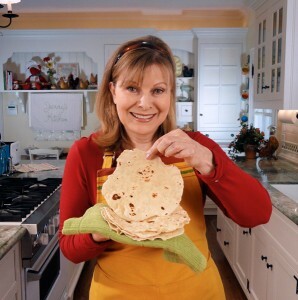 8 Comments on "Homemade Tortillas"
Why not fill it in with honey bbq chicken strips, lettuce, tomato, sweet vidalia onion and shredded cheddar!! Just a thought JJ! I know I’m not buying store bought tortillas anymore!! Yummmmmmmm…..I have always wanted to ask you about a cooking thing and keep forgetting to blog it. I am allergic tomost fresh fruit and veggies. I can not eat strawberries at all….but I can eat all other fruit an veggies cooked. Any adviceon how to cook mushy veggies and fruit and have it taste good? I am allergic to the berch pollin and when cooked it is cooked out. My favorite way with vegetables is to roast them. It makes them soft & brings out the flavors & caramelizes them beautifully. And it’s so easy. (recipe is in my book) Just put chopped & cut up veggies on a baking sheet, toss with olive oil, salt & pepper, and roast in a 425 oven for about 1/2 hour. You can even try 400 or 450. Shake the pan a couple of times or turn the veggies with a spatula. I do this with potatoes, sweet potatoes, red peppers, green beans, brussel sprouts, carrots, squash, onions, or anything I have around, trying for a mix of colors. Cut harder vegetables in smaller pieces and soft ones bigger. I hope you like it. Also, you can make “mashed potatoes” out of combos of other root vegetables like sweet potatoes, turnips, carrots, parsnip, rutabaga, I even mix potatoes with cauliflower too (also in my book).